Last year when I ordered the Greedo print, I also picked up another fabric from Spoonflower. 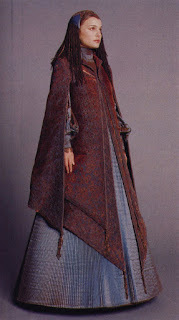 It was a fabric mimicking the fabric in Padmé Amidala's peacock gown from Star Wars: Revenge of the Sith. If you don't recognize it, it's not so strange. Eventhough it featured in the marketing, and is seen on the film poster, the scene in which she wears the gown was cut out from the final film. The original costume is made is mainly made up of a coat in Brown shot devore velvet worn over a fortuny pleated shot brown/blue satin gown. To be honest it was never a favorite of mine, but I really liked the pattern of the reproduced fabric. 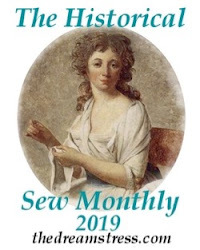 At Spoonflower you can have the pattern printed on a variety of fabrics and I chose to have it done in cotton satin, by recommendation of the creator of the print. I only ordered a meter or so, hoping to be able to some day just make something Amidala inspired from it. I even took the time to copy and cut out the pattern pieces, but didn't go any further. Now when my silk for my Lady Poe ensemble disappeared I still wanted something new to wear for Celebration. This pattern was similar to the peacock gown, in that it looked to be a coat worn over a petticoat, so I ordered some more of the peacock gown fabric. Overall the pattern was easy to follow. There were some steps, especially around the collar, that I didn't quite understand but I simply followed the instructions and the result came out good. I had read a review that said that the pattern was fairly tight. It's closed all the way around, so you need to pull it over your head and then get the waist by tying the sash. I don't know why but I had cut out the pattern a size or two too large, so my problem was actually that it was too large and bulky. Since I still wanted to have a fairly large skirt and be able to put it on and take it off with easy I didn't take it in too much though. I made the center back seam more curved and made the darts belowe the waist larger, but kept it fairly large above the waist. One difference to the envelope picture is that the skirt portion is a lot slimmer, which suited me fine but don't expect a traditional big 1950's New Look-skirt from this pattern. Except for the size adjustment I made three major changes from the pattern. I did not sew the center back seam all the way to the hem. 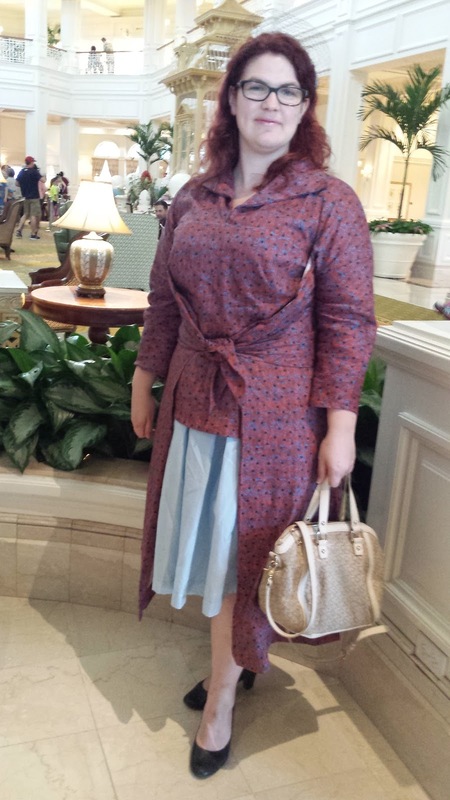 Instead I have a split skirt in the back, making it look more like a coat than dress. I also didn't add the front skirt portion. I wanted to be able to combine the coat part of the dress in different ways. Without the front skirt though it ended just at the waist, showing off my tummy. To hide that I lengthened the bodice front section down to the top of my hip. 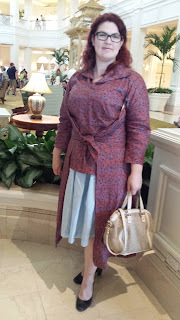 At the Ladies of the Legions' tea I wore the coat with a blue summer dress under, to make it look more like the original. I also wore the dress to a party on Friday night, and then I paired it with a pair of tight black trousers instead. I actually prefered the trouser look, but I didn't have any photos of that. Overall I can really recommend the V2401 pattern. It gives a really nice classic look, and since the skirt is quite restrained it doesn't scream 1950's. There is also no need for buttons or other kinds of fastenings. I made the whole outfit in around three days. If I was to change one thing it would probably be to make the sashes that tie around the waist a bit longer. This is really an obscure fan fashion, no person that I ran into at SWCO recognized the Amidala inspiration for the outfit. 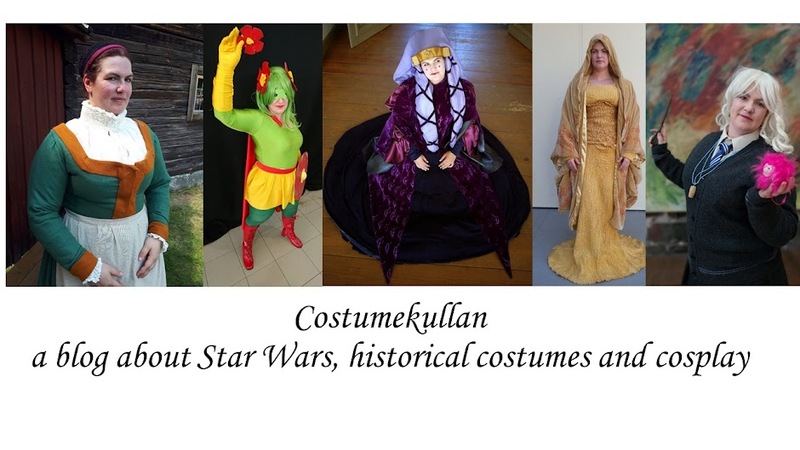 I'm looking forward to wearing it and feeling like a queen at non-Star Wars events though.